With the Portland Timbers at 6th place in the standings, it’s hard to forget how this season all started. It seemed like it was the wrong kick from day one. With goals in the wrong side of the field and the painful question of, “Are we going to bounce back?” This has been every bit of unpredictable and exciting for the Portland Timbers. Overall we all know there is not enough time left to fix the mistakes of the past, but there is, for sure, plenty to reinforce the good and even make it to the playoffs and have a shot at the CONCACAF Champions League top spot. However I have to ask if that is indeed the only thing we should be thinking about right now. I believe there is much more depending on this match. Timber fans, this is a crucial game that not only could shape the rest of the season, but it is also a game against Real Salt Lake! Have we forgotten we have history here? Do I need to say it out loud? Timbers need to win! TIMBERS NEED TO WIN! There is no way around that. Not only is this a very necessary win for the Timbers’ season but more than anything is a very much needed pride boost for the fans. Timbers have to beat Real Salt Lake! They have to beat them here at home and send Real Salt Lake back with empty hands. It is no secret that the conversation right now is that Real Salt Lake is coming to win. They don’t see it any other way and don’t predict it going bad for them. They are confident and that attitude is what scores goals. So how are the Timbers going to respond? First of all they have to play good defense. They need to reach out to the basics of the game. This is about pride! They have to defend the home front! They are home and the score must reflect that. Traditionally being home is what gives a team their head start but in this case the effect on the Timbers is somewhat negative and even against the odds. The winning streak Real Salt Lake have upon the Timbers puts the pressure on and the concern is if that will make it even harder for the Timbers to win. Timbers fans across the state will come out to see if this is the day the Timbers will break Real’s winning streak. This game should be taken by the Timbers as a very unique opportunity to bring back some that strong and fiery flame Oregon’s soccer has. It is a game to bring out the passion of Oregon’s soccer fans into one and only one place, Providence Park! Let me try to give you a brief picture and from there, you can decide or work on your own strategic plan. So far, we know the Real Salt Lake is not bringing their top game. Nick Rimando and Kyle Beckerman have been called for the US national team. They have three defensive players out with injuries and to be honest, they are not looking that hot. 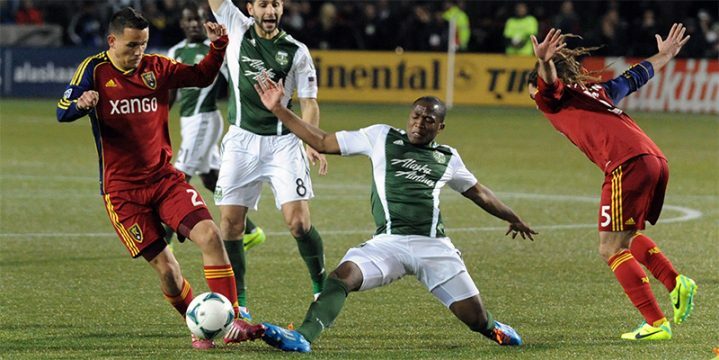 So how will the Timbers take advantage of their shortcomings Friday night? The first thing that comes to my mind is the injuries the Timbers have in the current roster as well. Midfielder and Captain Will Johnson is out of commission for six months with a broken leg. Therefore, Ben Zemanski must step up to the game. He will have to play strong defense and at the same time, step back into the offensive attack. With midfelder Steve Zakuani out as well (groin injury) and the questionable return of defender Pa Modou Kah (calf injury) we have strong players who will not be able to show up and push Real Salt Lake as easy as we need to. So what’s the backup or, should I say, the main plan? The lead is an obvious one. Everyone is counting and looking at Diego Valeri. His stellar performances in the last few games, especially the one over San Jose last Wednesday, has given the Timbers a taste of what good chemistry between Zemanski and him can bring to the field. These two will be the key to a Timbers’ win. Midfielders Diego Chara, George Fochive and Rodney Wallace need to show up and help shake Real Salt Lake’s defense. If they can give the Timbers the edge in time of possession in the first 45 minutes they will very well increase the chances and even guarantee a win before minute 90 hits the clock. Yes these are very specific demands upon a team that has had ups and downs so far. But the reality is that there is no other way around. The Timbers must bring their A game to leave the sour taste of the beginning of this season behind. This is a crucial win for the remainder of the season, but it is also a very much needed one to take the Timbers’ pride back. The team desperately needs a way to solidify and boost their performance in this current season and, as a bonus, defeat Real Salt Lake at home on Friday night. They cannot run away from risks, this is not the time to be shy. Strategic defense and strong attack is the key to make it all happen for a win. The Timbers cannot rely on fate to keep Real Salt Lake out of the goalie area at any time within those 90 minutes. The Timbers should not pin their hopes on a Vancouver slip for a possible playoff pass. I don’t know about you, but I say Caleb Porter must be ready to unleash his best game yet or else the Timbers are staying home and not on a very good note at all. If the Timbers offense comes through, they could actually make it a super moment and cease it to not only improve their chances to make it to the playoffs and a chance at the top title of CONCACAF, but more importantly get the historical win against Real Salt Lake that it’s been long over due to all Timbers fans.